This photograph is surprising because of its diminutive size, which is more suggestive of a wallet photo than a photograph displayed in a museum. The photograph's size makes it seem unassuming next to larger works, despite being taken by such a revered artist. Man Ray uses a long exposure to capture several moments in one image, the passage of time shown in the movement of his pen light. He has created a dream-like scene in which it is possible to write in the air. Behind Man Ray is a shape made of lines drawn on the wall, their sharp perspective seeming to create an an invisible plane in front of the wall. The light writing in the foreground similarly produces an invisible plane. The photograph disturbs normal spatial relationships and creates depth with a series of two-dimensional planes, preventing the viewer from visualizing a realistic three-dimensional space. 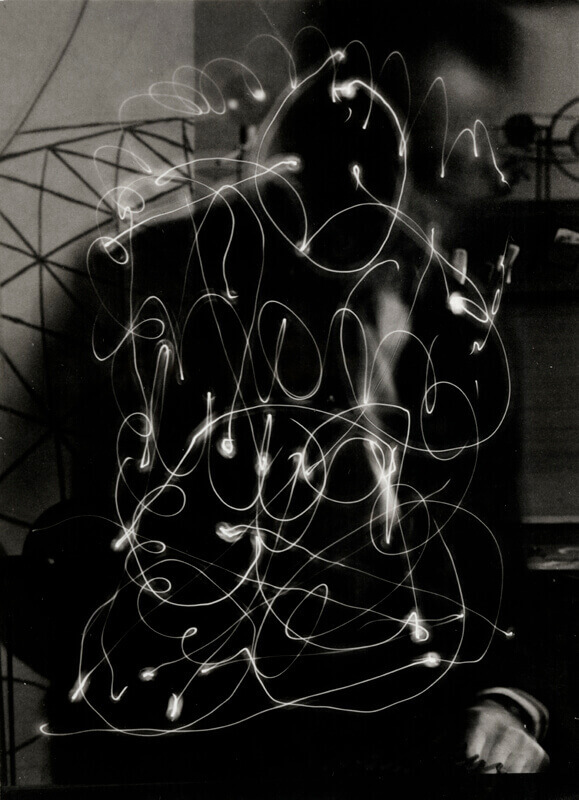 The lines of light trace Man Ray's free-flowing movements. The light writing invokes the concept of automatic writing, one of the first means the surrealists used to express the unconscious. The scribbles of light are reminiscent of children's drawings, valued by the surrealists because children are thought to be more in touch with their impulses, unencumbered by social or moral restrictions. The lines in front of Man Ray's body are the brightest, suggesting that the light is an expression of his inner being. The background lines on the left merge toward his head and seem to come out the other side in the form of the background shapes on the right, as if ideas were bursting from his head. His head is barely visible, but a circle of light is drawn around where the head should be, suggesting that the expression of his unconscious through this drawing is a more accurate representation of Man Ray than his photographic image. The image plays with the idea that a portrait can express the interiority of its subject, an ideal that dates back to the Renaissance. Man Ray expresses his identity as an artist through the light writing, but he also mocks the idea that the portrait can express his interiority. His signature, another means of expressing one's identity, obscures his already blurry image. The signature is backwards to the viewer; it takes very close looking to differentiate the letters from the scribbles. The photograph is actually a cropped version of the original, in which it is clear that Man Ray carefully set up the frame of the shot he wanted to produce. Yet the photograph maintains an element of chance, because the ultimate appearance of the light writing was difficult to control. The frame visible in the original photograph adds another layer to the series of planes the artist set up. The cropping of Bowdoin's version obscures that set up, so that Man Ray's method is less visible, presenting instead the pure image that Man Ray wanted to express.